... cool to think that things might begin to change - bit-by-bit - here in San Diego." Comments from others echoed the impact that this one person's story had and how far throughout the San Diego community the experience had spread. We're sure that each and everyone one of you who participated in the Challenge have similar stories and have created your own ripple effects. We hope you are taking time to put your experiences to good use- telling your friends, your family, your co-workers, your local representatives about how hard it was to eat on $34/week. Most importantly, we hope you carry your experiences with you and let them guide the decisions you make in the future regarding public assistance programs. Think about how hard it was to focus without food when you vote in your next representative, will your representative cut or save these programs? Think about how expensive healthy foods were and what you had to give up when you vote on the San Diego minimum wage. Think about what you can do to support strengthening our local food systems and consider donating to a local organization doing great work... it starts at home; it starts with us. And We're Off; the 2014 San Diego CalFresh Challenge Begins! Monday, September 15th marked the official kick off of San Diego's CalFresh Challenge. Spearheaded by the San Diego Hunger Coalition and a large group of partner agencies supporting hunger across the county, this event challenges participants to live a week on $34.31, San Diego County's average CalFresh allotment. Over two dozen San Diego residents have elected to take the Challenge this year, and we look forward to sharing their feedback! Beginning Sunday afternoon, recipients received an email welcoming them to the Challenge, sharing a background on the CalFresh program, and providing some thought provoking questions on how to purchase healthy meals on less than $5 a day. Are you participating in the Challenge and have a story to tell? Please share by emailing cfchallenge@hungeraction.net! Already Gearing up for CalFresh Challenge 2014! Themes of this year's Challenge included the art of planning ahead, limited options while on the go, and vegetable cravings. We were able to show the community some of these Challenge themes through pictures at our anti-hunger documentary screening of A Place At The Table on September 26th, 2013. It was a great night of hunger awareness and inspiration and we thank our participants for providing such great insight and visuals. Every year brings these new perspectives and stories and we're already gearing up for next year's Challenge in September 2014! To stay up to date with San Diego Hunger Coalition's events, advocacy opportunities and CalFresh Challenge 2014 info, please visit our website here. While the USDA MyPlate suggests for your plate to be half fruits and vegetables, is not always feasible on a tight budget. Those who happen to have the time and space to maintain a home garden can cut down their costs of fresh produce. This Challenger mentions the joy of having homegrown vegetables to add to the plate. Finally a much needed touch of green to a meal! The addition of lettuce and other vegetables on Day 6 made such a difference after the lack of fresh fruits and veggies during previous days. A meatball sandwich with a side of brown rice with homegrown vegetables made such a difference to the meal and was so much more flavorful. I miss having all the veggies I want! Choosing to eat at places such as McDonald's isn't really a choice if it's the only option. Talking about the biggest bang for your buck, the infamous dollar menu serves to be cheap and filling. It may not be the healthiest option but will certainly fill you up. This Challenger shares the convenience of the dollar menu. A rushed Friday lunch on the road left me with few options with the very few dollars I had remaining in the budget. About to meet with friends, I had to pick up something quick because I couldn’t afford to go out to lunch with them as we had planned a few months back. I didn’t have time to run home and grab a prepared meal and definitely didn’t have a microwave to make it edible. I was left with the only option I could think of- McDonalds. When I drove up to the speaker box to order, I looked at the menu and realized that even though they offered “healthier” options, I couldn’t afford a single one of these items. The only thing I could afford with my remaining budget was limited to the dollar menu and definitely didn’t qualify as health food. I sighed and ordered my cheeseburger and McChicken sandwich, just hitting my budget with not a penny to spare. I quickly ate my lunch and realized McDonalds really do rule the road: quick, cheap and easy food for on the go. I had vowed to try my best to eat well on the CalFresh Challenge but realized that is a lofty goal when accessibility and nutrition don’t always run parallel to one another. Calfresh/SNAP is an important Federal nutrition program to thousands of families in San Diego. It is unfortunate that conservatives have accused recipients of fraud. There is minimal evidence that SNAP users engage in fraud. There are 47 million of Americans that rely on SNAP as a means of providing nutritious food for their families. This Challenger reflects on the political issues surrounding cuts to SNAP. I found myself confronted by a dilemma last night. Our neighbor recently went through a serious surgery, leaving her off her feet for the next month. In an act of good will, my roommates and I decided to put together a food basket with fruits and muffins for her and her caretakers. I offered to gather, bake and bring… the only problem was, I didn’t have any money budgeted for helping out my neighbor. I struggled with my fidelity to the Challenge and raising my own internal awareness of the daily choices many low-income Americans face versus helping out. In the end, I did both. While I stepped outside of the confines of the Challenge to show support for a neighbor, I thought about what I could have done if I didn’t have money. Most likely, my neighbor and her family would have been just as appreciative for my visit, regardless of the basket of food in my hands, but would I have felt comfortable showing up with nothing to share? And if I was truly in a position where I could not afford food for myself on my own, would I have the time and energy to reach out to others in need? Questions arose: How does our focus on “just making it through the day” affect our ability to be compassionate and contributing members of society? What else would we be able to achieve, not only as individuals, but as communities and a nation if we no longer had to think about meeting our basic needs. I’ll admit, walking into the grocery store to buy fruits and muffin mix while my stomach growled and I had no money to fill it did not make me the friendliest customer in VONs. Ironically, this year’s CalFresh Challenge is occurring at the same time as the passage of one of the largest proposed cuts to SNAP in the history of the program. Right wing politicians are circulating a media created image of a “surfer dude” living on CalFresh to evoke unjust claims of “public benefit fraud and abuse” while claiming to balance the budget by completely eliminating food assistance to 3.8 million Americans in the coming year. Meanwhile, 1 in 4 children struggle with hunger at some point during the year, and if these cuts are enacted, this number is only sure to increase. Political pundits and legislators alike gloss over the surface of key reforms, too busy spouting rhetoric to engage in meaningful conversation about how to truly improve our nation’s food systems. As a result, we are unable to “reach across the aisle” to help one another end a plague that is slowly deteriorating the status of our nation. Take Action Against Cuts to CalFresh! You may ask yourself what is the Farm Bill and what does it have to do with CalFresh. Just in luck, we are here to help you through this! The name Farm Bill can be confusing because in fact it does not solely deal with farms. About 79% of the current Farm Bill’s budget goes to federal nutrition program such as CalFresh (also known as SNAP nationally), while the rest of the budget is distributed among other programs such as crop insurance and commodity programs. The Farm Bill is up for renewal every 4 years. The current Farm Bill was passed in 2008 and was suppose to go up for renewal in 2012. The Food Stamp program was created by a bipartisan working group, and historically the program has found bipartisan support; however, more recently SNAP has become the target of the Republican party as a misguided attempt to "balance our nation's budget on the backs of the poor." The revised version of the Farm Bill goes to the House Tomorrow, included is a $40 Billion cut to SNAP. If passed, this cut will potentially result in 6 million SNAP recipients losing benefits all together and cuts for the remaining 43 million Americans receiving assistance. For those who are familiar with CalFresh (or SNAP), you already understand the importance of this program. It allows qualified individuals and families receive additional money for food costs. They can buy healthy and nutritious meals in times of hardship. You can take action against the proposed cuts to SNAP. Congress needs to hear from you about the importance of SNAP to stop these cuts. Simply call 866-456-8824, provide the operator with your zip code and you will be connected with your Member of Congress. Please tell your Member of Congress to vote no to the $40 billion in cuts to SNAP! It seems to be a day of eye openers for some of the Challengers. Tight budgets also means tight choices and smarter decisions. Getting the biggest bang for your buck may not always equate to a plate full of veggies or ways to save time. The first Challenger shares a photo of her unintentional carb overload. While another shares a comparison photo that highlights time savers such as individually packed foods, are higher in cost. I never realized how cheap bread is in comparison to other food groups. Talk about an unintentional carb overload. 25 cents for a roll the size of a loaf of bread! Never realized how much we spend just to save time. I have been buying the individual packages everyday and have been spending nearly twice as much for the same amount of yogurt! For many CalFresh recipients hunger pangs may not be easily settled on a small budget. Constant hunger can have detrimental affects on one's health and energy. This Challenger reflects on the importance of CalFresh and pushes to take action to support it. On the second day of the challenge I woke up in the middle of the night feeling pretty hungry. After a bit of tossing and turning, I decided to eat a small bowl of cereal. I knew it would bite into my budget for today, but I'm crossing my fingers that I can just ease back on my portions a bit. Overall I find myself thinking more about food and when I should let myself eat again. I understand why someone might choose less expensive foods that might not be as healthy just to have something to satiate one's hunger pangs during times like what I experienced last night. My experience last night was a tiny fraction of what true hunger is like. I actually have a choice. I can actually stop this experience if I want to. Many people don't have that choice, which makes it disempowering and overwhelming.I know that the more time I spend worrying about food and being hungry, the less time and energy I have to devote to work and other things that need my attention. And this is why I believe so strongly in full access and participation in federal food programs: when people have access to enough healthy food, they can focus on things that will help them become more healthy and financially stable in the long run.The proposals currently being supporting by House Republicans are based on misguided understandings of what it means to be in poverty. Their proposals are not actually geared toward ending hunger, improving the lives of Americans, or even on saving money. If they were, there would be a drastically different approach to the Farm Bill - one that used actual research and experiences of people in need to create a nutrition title in the Farm Bill that protects the most vulnerable and acknowledges that access to food is a work support and cost cutting measure in and of itself. Thursday the House will be voting on their version of the nutrition title from the Farm Bill. Hearing from constituents is the best way to remind them that SNAP/Calfresh works to meet the true need that exists in our communities. Aside from tight budgeting for food as mention in Planning Ahead and Proceeding with Caution post, this Challenger discusses aspects of living on a restrained budget in general. After paying essential bills and utilities leaves no room for emergencies. Just imagine how unexpected medical bills or a loss of a job can take a huge financial toll on CalFresh recipients. I started the CalFresh Challenge today and had one egg for breakfast, and later I had black-eyed peas and bread for lunch and yogurt with fruit and cereal for dinner. As I prepared for the Challenge I thought about what it would mean for me, outside of the food aspect, if I qualified for CalFresh Benefits. Not only do people trying to get enough food to eat face the challenge of hunger, but there are other challenges when one faces severe financial hardship, as the vast majority of CalFresh beneficiaries do. As a household of one, the income limit for me would be $1,245 per month, or 130% of the Federal Poverty Line (as of Oct 1, 2013). After paying about $200 in taxes I’d have around $1,045 available to me. I pay about $800 for rent and about $30 per month in utilities. So after paying those expenses, I’d have $215. I would need to use that money to pay for gas for work, payments on my education loans, car insurance, telephone expenses, food, and personal and household items. From what I can estimate, I’d be well over my budget, by as much as $300. I’d need to renegotiate my education loan repayments (which would mean I’d have to pay more in interest over time) and I’d have to do whatever I could to avoid unexpected and emergency expenses. Even if I could find a less expensive place to live, I would likely be over budget each month. Living at 130% of the Federal Poverty Level means I would not have any extra money to boost our economy by purchasing clothing, entertainment, internet access, dining out, or really much of anything besides the very bare minimum. If I was able to qualify for SNAP/CalFresh benefits I’d probably get about $98 (much less than the $200 limit for one person, due to the federal formula for determining benefit levels). I could at least spend that in a local grocery story and not only get a couple weeks’ worth of groceries but also help fund the jobs of those employees. This was just an exercise on paper for me. But for many people these are the impossible choices they are forced to make. They are the real situations of real people who need real assistance like CalFresh. The Center on Budget and Policy Priorities reviewed the SNAP program (the federal name for CalFresh) and has credited the program for doing exactly what it is supposed to do: responding in times of need by expanding and it will, they have shown, shrink automatically as the economy improves and less people need help. In fact, they share commentary on how the SNAP/CalFresh program actually encourages people to get back to work. Additionally, the program will shrink even more if the working poor have a minimum wage above the poverty line. Over 84% of benefits go to households that contain vulnerable populations: children, seniors and people with disabilities. (Find more stats about CalFresh here) The SNAP/Calfresh program is vital to low income people and needs to be strengthened, not cut, so that it can continue to successfully decrease and eliminate hunger. Planning ahead for meals seems to be key to work on a tight budget. The first entry speaks of Challengers spending hours to plan and prepare meals in advance. Even with a few dollars to spare, these Challengers decided to hold off on purchasing a sweet treat as a precaution. We looked at our watches after we finished washing the pans and putting away what will be today and tomorrow’s lunches… 10:15pm. We had effectively been planning, purchasing, and preparing food for four hours and still hadn’t made a complete meal! The beans were still soaking and would have to be cooked and added to our quinoa salads in the morning. While these two CalFresh Challengers enjoy cooking, we are lucky to be in a financial situation that allows us to spend time doing so as a luxury rather than a necessity. This Challenge has already forced us to slow down, prioritize and spend much more time thinking about food than normal. After putting everything away and reviewing our purchases, we had spent roughly two thirds of our weekly food budget. (We skipped meat and stuck to high protein, lower cost beans, eggs, and quinoa.) Even though we seemed to do a pretty good job of budgeting and finding deals, I couldn’t help but feel overly cautious in the grocery store. Leaving VONs with a little more money left than we expected, we wondered out loud, “Is it ok to use some of our reserves to buy snacks or a sweet treat, or should we hold on to a few dollars just in case something happens and we run out?” After hearing horror stories of past Challengers who wound up with rotten produce or my own experience of running out of oatmeal and eating pasta for breakfast last year, we decided to air on the side of caution… at least until our sweet toothes kick in! This morning we got up, looking forward to getting an early start to the week, only to remember that we needed to finish making our lunches before leaving the house. It’s going to be an interesting week! It is hard for us to believe that a month has gone by since finishing the CalFresh Challenge. During mid September more than 60 San Diego County residents were united in eating on a typical CalFresh benefit allotment, just under $34.31/week. Participants were female, male, students, professionals, retirees, of different ethnic backgrounds and different family situations, mirroring the multitude of backgrounds and situations of CalFresh recipients. It's called the CalFresh Challenge because it is exactly that: a challenge. But through difficulties, Challengers found what we hoped they would find: a brief insight into what a limited budget might make a person feel, think or experience and appreciation for their own situation. We would like to thank all of you who participated in the Challenge and a special thank you to all of you who were able to take time from your busy schedules to write about, take photos, and document your experiences for our blog. The idea that it was "harder than expected" peppered our blog responses. Finding out their favorite fruits and vegetables were too expensive and needing time they didn’t have in their busy lifestyles to cook more basic ingredients frustrated many Challengers. The inconvenience of having to make a meal from scratch or compare every price at the store is a reality for CalFresh recipients leading busy lives themselves. Convenience is a luxury that they don’t have nor can afford. USDA research shows 64% of SNAP recipients spend 75 minutes a day on preparation, cooking and clean up for meals compared to people from higher incomes that spend 58 minutes on the same tasks. One of the many "challenges" Challengers faced this week was the unexpected need to cook. As many challengers quickly found out: convenience is an expensive luxury. What Challengers lacked in money, they were left to make up with time and cooking skills. Individuals with experience in cooking beans from scratch or making their own soup were able to plan ahead by preparing large amounts and eating it throughout the week while less experienced cooks or those with limited time were often left to buy food every day. Having to spend time planning and purchasing food each day ultimately increased stress for many Challengers, as they regarded their quickly dwindling funds and limited food choices. On a similar note, a hallmark of this Challenge every year has been the rapid change in how Challengers view food during the week. Even as early as Day 2, Challengers notice that food is no longer a luxury or social experience, it is a burden for which they must think about at least three times a day. It has been described as having an "obsession with food," analyzing quantities, time and necessity, figuring out how much will last for how long and for what price. For those utilizing CalFresh benefits, these stressors are most often compounded by other worries accompanying living at or below the federal poverty line: including struggling to obtain basic needs like transportation, clothing, shelter, and personal items. For many of you, the days of stretching dollars and hunger pangs may feel like a distant past; however, we ask that you remember those who continue to live the Challenge we briefly participated in. What does it mean for a person to live with such a limited budget for an extended amount of time? For some, their creativity may flourish, particularly if they have reason to hope for a brighter future. For others, it may become another difficult circumstance in an already difficult situation. According to the 2010 census, almost one third of people in San Diego County – over 1 million people – live in economic hardship below 200% of the federal poverty line (considered the bare minimum to get one’s basic needs met). 240,000 people are on CalFresh in San Diego County, up by 11% from last year. That increase is telling: The CalFresh/SNAP program is countercyclical – meaning that it is doing exactly what it was designed to do: expanding to meet the needs of low income people during the recession, and enrollment numbers will automatically decline as the economy improves. Removing people from the program and cutting benefits now will only increase the rates of hunger; it won’t solve our economic woes or the problem of food insecurity. We know that living on a CalFresh budget is difficult. But we also know that without this program, low income people would likely have little, if any, place to turn for food. Food bank leaders tell us that they already struggle to meet the needs in our communities; if CalFresh/SNAP benefits are cut or eliminated entirely, they won’t be able to fill in the gap. CalFresh is a profoundly important part of the social safety net for seniors, the working poor, and those who are unemployed and seeking jobs with living wages. Taking the Challenge and knowing the statistics are the first steps. Turning this knowledge into action through advocacy is the next step. Congress is divided on the funding of SNAP, with some of the biggest divisions being between Republicans in the House. The Senate-passed version of the Farm Bill cuts SNAP by approximately $4.5 billion over the next ten years. The House Agriculture Committee version cuts $16 billion over the same time period. GOP leadership, however, is preventing a vote on the entire bill because there is such a gap between those who accept the $16 billion dollars in cuts and those who would like to see much more. (Many conservative representatives are suggesting $32 billion but going as far as $133 billion cuts!) The House GOP is trying to avoid a vote on this bill, leaving advocates unsure what will happen. Please like us on Facebook! Or follow us on twitter to get updates on the Farm Bill and how you can get involved as the bill moves forward! We are so appreciative of all of our Challenge participants, whether you were able to send in blog entries or not. The act of taking the Challenge shows a dedication to understanding people and helping to understand hunger in its most basic form. We hope it has given you as much insight as the blog entries have given the rest of us and we can't wait to see you next year! Please take our extremely short survey on the process and give us feedback so we can make the next Challenge even better. The first entry of this post is from our CalFresh Challenger, Stan. He again shows us delicious food (supplemented from his garden) he has made for this week. Hunger doesn't elude him either and he recalls the feeling from last year. The second entry is a Challenger who decided to do a week on his own. His grocery list includes many organic items and we appreciate his unique perspective. After a big meal last night I was not hungry this morning. I forced myself to eat two small flour tortillas for breakfast with my coffee and had a couple of apples for lunch. I forgot about the danger of work meetings and went to a staff training at 1:30 that had a heaving table of snacks to tempt me. I was good and just watched others eat the food that I could not. By 3pm I was feeling the dull headache and hunger pangs that come with not eating enough. I remember this feeling from two years ago when I took the challenge. I can also relate to some of the other bloggers that are looking at their remaining food stores and dwindling benefits and wondering if it will last through tomorrow. It’s like some sort of natural rationing mechanism kicks in and you ask yourself do I really want to eat that right now or save it for later? Reflecting on the week, my wife and I were discussing how much of an impact our three community garden beds made on our experience. Without it we would have had much less to work with – Tomatoes, peppers, onions, raspberries, gooseberries…I have not purchased an onion since April. I have 19 pints of roasted tomato sauce in the pantry I canned in July and August (we use it for pizza sauce, spaghetti sauce, bruschetta, etc). I estimate the same amount of produce consumed this week from the garden would have cost me at least another $20. Last night I started a no knead ciabatta dough and put it in the oven with the light on to rise for 24 hours. The recipe said let it rise for 18 hours, then turn it out on the pan and let it rise for another 2 , then bake. I don’t know if it was because I chose to bake a loaf of bread on the hottest day in recent history, or if I let the dough rise too long. In any case, when I got home today the dough looked more like batter than bread dough. Knowing we had limited resources and no bread, I went ahead and put the wet dough in the oven. I am told in Italian, Ciabatta means “carpet slipper”. What came out of my oven was more like a salty sock. Oh well. My wife said the crust made a good spoon for the soup, and my Chihuahua Chico (my sous chef) liked the bread so it was not a total loss. Tonight we had butternut squash soup with really tough Ciabatta bread. Tomorrow – to the garden to get beds ready for fall planting and clean up the leftovers for the week. Before starting this little journey I recruited my wife to go along with it. We have professional jobs that involve lots of food and drink-related events. Also, she does most of our shopping and cooking (in her “spare time”–yes I am aware of my own good fortune) so her buy-in was pretty important. Here’s a photo of the initial handywork she managed to pull together. We had $58.80 to work with because we are doing this for 6 days. We had food at home so we itemized that down to the penny, planned to use $36.02 worth of that food and that left us with $22.78 to spend–wife pulled it off at $19.90. This is a useful time for two observations. First, we got the Starbucks coffee at CostCo, which has a $55 annual fee. Please feel free to contact them here to encourage them to offer free memberships to CalFresh recipients. This isn’t a “reward” for needing help, it’s a useful way to make taxpayer dollars stretch farther and help people get on their feet. Second, I live in San Diego and today is the first Chargers home game. I have no idea if it is blacked out, but the thought of watching football with no local craft beer or unhealthy junk food is a little daunting. It’s not on the budget, so it’s the first legitimate casualty of my week on $4.90/day. I don’t have any illusions that attempting to live for 6 days the way that some people live all the time is some great accomplishment nor that it’s a true portrait of that life. What I hope this week turns out to be is an opportunity to raise awareness that, in my opinion, providing people basic levels of nutrition isn’t worthy of a tacky attempted insult. I also want to share some recipes and tricks so that maybe someone living on a tight budget picks up a new recipe–or shares their food stories so I can learn something. Life is hard, at least for many, and shaming people for needing help is disgraceful. We can encourage hard work and frugality and education and sacrifice without also putting people down for needing help. Earlier in the week I was almost wishing that I only participated in the challenge by myself instead of including my entire family. I thought that I had it more difficult because there was greater pressure to provide wholesome and nutrient rich meals and snacks. When you need to include fruits, vegetables, quality protein, and whole grains its takes a bit more planning to create a menu and grocery list. I was jealous that those who were only participating as single people, even if they had families, because they could get away with peanut butter and jelly sandwiches and top ramen for meals and still have funds left at the end of the day. However, the more I thought about it, I started to change my mind. I realized that while shopping for a family, even a small one, there is a benefit of economy of size. You can buy a better variety of food due to the larger budget. Most items that you buy in the grocery store are aimed at families. Chicken breasts are packaged at least 5 breasts together and costs anywhere from $5 to $10 depending if you buy boneless or not. If you buy boneless at $10, that’s a third of your weekly budget on one food item! Additionally, larger packages are cheaper by the ounce/serving than smaller packages. I realized how difficult it would be to buy a variety of healthy foods such as fruits, vegetables, and quality protein on a single person’s SNAP benefits. Individuals are more likely to pick higher sodium and lower nutrient foods such as top ramen just to make sure they have enough money for the rest of the week. Even with just two people it would be difficult to have enough benefits to afford to buy nutritious food. It seems like the highest risk groups are young adults and the elderly. Both groups need higher quality food: the young adults to prevent problems due to malnutrition later in life, such as osteoporosis; and the older adults to maintain health as their health begins to decline. This has been a very eye opening experience. It really helped me to realize the problems that many people face in regards to eating nutritious food. A healthy diet is so important when preventing health problems and in helping you to heal from illness. The more and more I study about diseases that occur in the elderly, the more I see a common denominator: diet. Almost every disease that I have studied thus far stated a lack in nutritious food as a contributing factor. I can definitely see that something needs to be changed. So, this has been an interesting week, and I have to admit that I am glad it is over. It made for a complicated week doing this project and feeding a family that was not doing the program. But, I learned some things. Living on a tight grocery budget is not easy, but it is totally possible and with planning it can be done healthfully. My diet may not have been the most balanced this week, but I could have made it better with two changes. First, I needed to plan better. I should have sat down and really thought about each meal and planned accordingly. The other significant take away is that cooking for one on a budget is harder that doing so for a family of five. When you shop for one variety is harder to accomplish and you can't buy big packages as easily. When you buy big you spend less per ounce- making the product cheaper. Add this to the fact that many single seniors lack the desire to cook and plan and I can see how balanced nutrition for these people could be very difficult to have happen. This project has inspired me though, to plan better, to spend less and to but less junk. Just as solving a Rubik's cube isn't impossible or even highly improbable (This 6 year does it in 37 seconds, http://www.youtube.com/watch?v=zLQJ93B5Nl0), eating healthfully on tight budget isn't either. The key is having the time, skill and knowledge to plan accordingly. Some of our challengers didn't have any of these things and found it incredibly difficult to satisfy their healthy cravings this week. Today is the last day for the challenge!!! And it's a hot day. 106 degrees. Because I had work last night and tonight I slept most of the day. I woke up at 10am ate a strawberry toast and 1 sunny side up egg. Then my little sister wanted to go get ice cream so we did. I had approximately $14 left to spend so I spent it on ice cream! I bought an avocado shake for $3.99 and ube flavored ice cream (a Filipino brand) for $6.99! I had that all day until I fell back asleep at 3 pm. When I woke up I had to go to work. This entire experience was good. It made me realize it's hard to eat healthy on such a small budget. Let alone eat enough food. I resorted to cup noodles, top ramen, and lots of eggs this entire week. Because I'm a student it was normal to eat like this. But I can't even imagine to feed kids on this budget. This is definitely an eye opener for me! Today is day 6. It’s almost over!!!! So today, I had 1 scrambled egg for breakfast and 1 slice of toast. Then it was off to school. I had 2 slices of bread on break. I used the strawberry jam again! Its still delicious though. I am not tired of it yet. By the time I had arrived home, it was late so I ate a mid afternoon snack/dinner. I had top ramen with sunny side up egg and grilled the other half of the bell pepper I did not finish. The egg and bell peppers added bulk to the ramen. Then it was off to bed for me because I work Friday nights. By the time I woke up, I had to leave for work so I didn’t really eat much today. So far, I have spent $19.22 with extra groceries left on this challenge and it’s the 6th day. I can definitely have a big meal tomorrow! A person can definitely live of off this budget, but its hard to be healthy unless you plan out your meals for the entire week. I didn’t so I had to rely on cup noodles, top ramen, lots of egg and bread. But I do think it’s do-able if the food was planned out properly and you bargain hunt for food. I did it! (Pretty much. . .) Overall, I am glad this is done. I do not agree with the budget, but then again there are also other aspects of foodstamps that I don't agree with but that's a whole can of worms. I am also happy to not be blogging. I'm not a blogger, so I'm grateful to not be doing that either. Something's gotta change. Healthy food, raw fruits and vegetables need to be affordable or made available to all. Day 6 of CalFresh Challenge- Today I went to the store and purchased a head of romaine, an avocado and the cheapest bottle of olive oil dressing I could find for my dinner. For lunch I had a can of mixed vegetables that were on sale for one dollar. This came to about five dollars. The challenge is going okay, but I do have to admit that its getting harder and harder each day. I see all these delicious foods and its hard to resist from purchasing them, especially when your so hungry! And this weekend I won't be able to go out to dinner because it definitely will not fall within budget. But that's okay, perhaps an early Sunday dinner somewhere. My canned vegetables were good but not the most fulfilling. This challenge is super hard and like I said before it's really hard to eat healthy. I was craving a salad and so that's why I got the head of lettuce. Actually that was pretty inexpensive, it was like $1.29. I think it actually taste better than the bagged lettuce, it just takes longer to prepare since you have to wash it and cut it up. Just the basic foods such as fruits, vegetables and meats on this income would be extremely hard to manage. That's why many eat canned goods, cause there's lots to choose from, they're non perishable and less expensive. I'm glad to have been introduced to this challenge, otherwise I would not have been made aware of the limited amount of income given to many people. What this challenge has taught me is to never ever take for granted what I have, and in this case food. Thanks CalFresh! One more day to go! Way easier said than done describes the CalFresh Challenge. Unless someone has cut coupons to get a can of soup for 89 cents over a dollar or drank cold water to tide them over in between meals, it's "easy enough". A sigh of relief can be heard in Challenger's posts and a realization of how much harder this actually is reflected in their writing. Almost there, one more day to go. I have to say this was harder than I thought. For breakfast I had a yogurt with some cut up apple in it. For lunch I made myself a chicken salad. I bought some lettuce and I had some chicken left over from yesterday's dinner. For dinner Since I had to prepare myself for my clinical rotation for Saturday I splurged and bought myself a chicken sandwich from McDonald. It was only $1.00. I would of usually bought french fries and a drink but I went with the sandwich only. One more day to go. Should be easier since I have clinical rotation. Will see how it goes. I'm not hungry. I ate tons of top ramen. I'm craving sushi, mashed potatoes, a whole hearted meal. Oh well. Yes, I agree that this is a difficult budget to manage. Especially if you're busy. There must be a compromise possible somewhere. I made it. I am sure glad it is over. Even though it would be nice to keep it up because it would save me money at the end, but it would take a lot of preparation and creativity to keep it up. It does make you think of all the people who do survive on less than 5 dollars a day every day and they don't have the option of saying I don't want to do this. For breakfast today I had a peanut butter and jelly sandwich. For lunch I had only a salad. It was so hot that I did not feel like cooking on the stove. For dinner I had some chicken fajita, which I found on sale for $1.99 a pound. 1/2 a pound was enough for me. I had it over some white rice. Maybe If I had more time to dedicate to grocery shopping, using coupons and looking for sales I would keep doing it. September 14th, 2012 Friday TGIF! Today was another day of clinicals for me, which also meant a packed lunch for the road. On my way to the hospital I had a muffin and another one for a little break. When I finally made it home for lunch I made half of a sandwich and another cup-of-noodles. Spending the rest of my day out and about and ending with paperwork, I made rice and egg for dinner. I'm almost there! September 15, 2012 Saturday Hello weekend! For the afternoon I spent my time at Panera Bread reading and taking notes for school while snacking on the food that I brought. Panera is probably one of my favorite spots to get things done and there is even complementary water to keep me hydrated through the heat. For dinner my sister and I had left over meat from tacos accompanied by fried rice. Washing dishes I realized I didn't take my picture, but I can assure you it was fulfilling. While grumbling tummies speak louder than words, Stan Miller reminds us that SNAP keeps 4 million out of poverty each year. A broader perspective keep in mind as we prepare for potential cuts to this crucial program this fall! On the way into work this morning I was listening to a report on the 2010 poverty statistics on NPR. Year over year poverty figures remained flat but still higher than they have been in decades. The reporter went on to say that had it not been for the SNAP program (federal benefits known as Calfresh here in California), another 4 million people would have fallen under the poverty line. While I have had an easier time with the challenge this year, I find myself wondering like many other bloggers, just what I would do if I really needed the benefits, but did not qualify for them or they were not available? As a child, I know there were times in my life that my family qualified for benefits, but we never took advantage of them. In addition to the garden I mentioned last time, we would hunt to put meat on the table. It sounds a bit barbaric to me today, but one of my favorite thanksgiving meals was one of rabbit, pheasant, and veggies we had either frozen or canned from the garden. I was too young at the time to realize that we did not have a traditional meal because we could not afford to purchase the food for one. I have read that during the 1940’s, approximately 40 percent of the vegetables consumed in America were home grown. Today, the Natural Resources Defense Council reports that 40 percent of food in America is wasted. The average American throws away over $40 in the form of 33 pounds of food each month. Those numbers speak very loudly while going through a challenge that gives you just under that amount for a week. Like many others going through the challenge, I am making use of everything I buy. I feel very grateful today. Meals for day four included Chilies rellanos burritos (remember the roasted peeled chilies from the first night?) spinach salad, chips and salsa, and more beans with ham hocks. Eating breakfast has been something new for me this week. Normally I have a couple of cups of coffee and make lunch the first meal of the day. This week I’ve tried to have a bit of breakfast before leaving for work. It’s made me late a few days, but has alleviated hunger through most of the day and allowed me to work until 2 p.m. several days before breaking for lunch. Day five I made omelets for breakfast had an apple for lunch, and then went big on dinner with enchiladas. I also prepared a no knead dough for a ciabatta bread for tomorrow night’s dinner. I did run to the store for some flour, yeast and 2 tomatillos. I now have $2.96 in benefits remaining. 2 egg omelet with spinach, green onion, tomato and cream cheese. Topped with tears of green salsa and sour cream. 3 pounds of green apples for the week. Had one for lunch today. Happy Friday! We're almost there! Last nights dinner was spaghetti. I used a jar of garden vegetable spaghetti sauce that was on sale for 1.25, added the rest of my tomato, and some .25 packages of seasoning(salt & pepper and garlic) to season a bit. I found these packets at a local Asian market. I used 1/2lb of lean ground beef- that was all I could afford. I was just so happy to be able to eat something other than top ramen, hardboiled egg, and a pb sandwich.Update- our halibut ceviche was a success and I snack on that as well. We still have half of the large bowl left, so it should hold us down through the weekend. This morning, I added some banana to a slice of bread and peanut butter, which got me pretty full. Got a busy couple days ahead so I'm hoping my hunger won't get in the way. Its going to very warm this weekend, out here in San Diego (90-100degrees)... Stay hydrated everyone!!! What happens when the food runs out??? Today will be my last day of actively participating in the challenge. 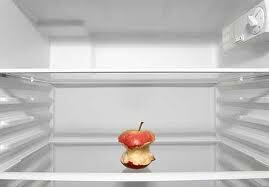 I came home today to discover the refrigerator door ajar. Apparently the last person to close the door assumed it had closed all of the way, when it did not. All of the food in the refrigerator was warm and no longer edible. Since the majority of our CalFresh Challenge food was in the refrigerator, we do not have enough food to last the rest of the week. Even though this was a large blow to us personally, luckily we have the funds to re-stock our fridge. It also made me wonder what a family on SNAP benefits would do in this situation. This would be incredibly disheartening and scary if we were truly on such a limited budget. So, I did a search for food pantries/banks in our area (Vista, CA). Even though I will not be able to blog regarding the food challenge, I will still blog regarding the difficulties of living on SNAP benefits through the rest of the week. Many of you now have your CalFresh Challenge diets down to a science, but that doesn't mean you like it or think it's healthy... bound and determined, you're going to keep doing what keeps you full. Heading down the home stretch. this brought my new total to 33.15. So far I have managed to stay in budget and have what I need. It lack variety, certainly, but it works. Day 5 of CalFresh challenge. -Opps, I almost forgot to blog. Well today hasn't been much different than any other day as far as my diet is concerned. Pretty boring. I had a banana this morning, 2dollar yogurt from costco and a can of tomato soup for dinner. This all came out to a little over five dollars. I will see what tomorrow brings.